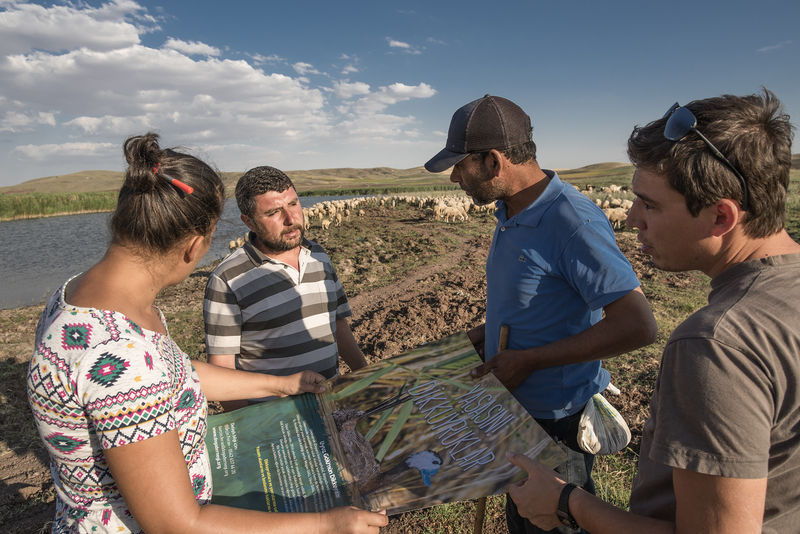 Doga is actively working with local communities in Central Anatolia to build their capacity on monitoring of the species and safeguarding key breeding habitats of the species with the support of OSME. The White-headed Duck (Oxyura leucocephala) is a diving duck listed by IUCN as globally Endangered since 2000. The global population of the species is declining. Its global population size is estimated at 7900 to 13000 individuals and, in some years, up to 68 percent of world’s White-headed Ducks winter in lakes of Western Turkey, primarily the Lake Manyas IBA. National Red List Status of white-headed duck in Turkey was determined as Endangered in 2004. At that time, estimated breeding population size was 200-250 pairs which have declined to 82-168 pairs according to a more recent assessment in 2013, showing a severe decline. Main reasons for this decrease are habitat loss due to extensive use of water resources feed the breeding sites of the species, resulting in drying out of wetlands. Direct persecution towards the species is another issue. In Turkey, the species breeds mainly in Central and Eastern Anatolia, while main wintering grounds are located in Western Turkey. Burdur Lake, once a key wintering ground of the species does no longer host excessive numbers most probably due to increased salinity of the lake. However, Lake Manyas in the Marmara region has become a key refuge for the species hosting up to 3550 individuals in winter 2017. Today, in Central Anatolia, main white-headed duck breeding grounds are Lake Uyuz, Lake Mogan (both in Ankara province), Sultan Marshes (in Kayseri province), Akkaya Reservoir (in Niğde province), Lake Ulaş (in Sivas province). Doga is actively working with local communities in Central Anatolia to build their capacity on monitoring of the species and safeguarding key breeding habitats of the species with the support of OSME. Furthermore, in 2018, Doga launched development of an agricultural rehabilitation plan for Lake Burdur based on the promotion of less water demanding products, such a rain-fed Damascus Rose. Doga is also a member of AEWA White-headed Duck International Working Group.